Only one hour north of Ubud, the beautiful Kintamani region in East Bali seems far removed from Kuta's busy beaches. Mount Batur rises prominently above a vivid landscape of greenery; crystalline Lake Batur rests inside the active caldera. Interesting villages and Bali's highest temple cling to the rim of the active volcano. Kintamani is a postcard-perfect reminder of what made Bali so magical before the hammer of tourism struck. With good roads to the region, Kintamani can easily be explorer on a day trip from Ubud or even South Bali. 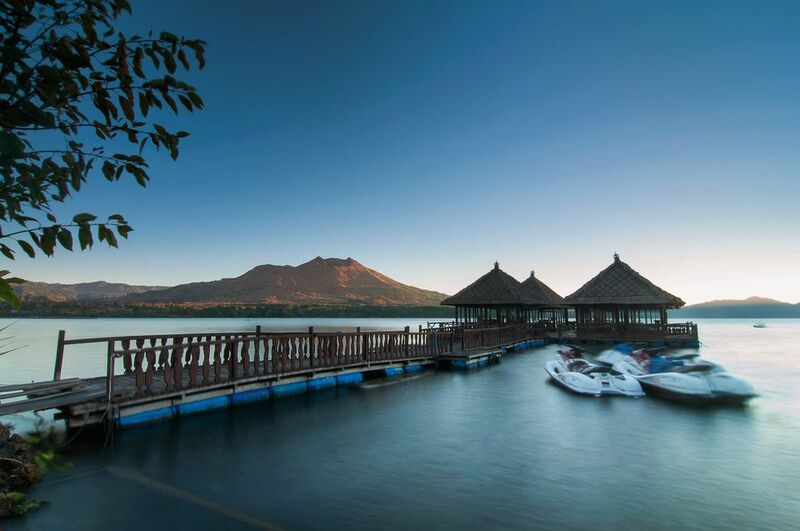 With excellent views of the volcano and lake, the village of Penelokan has become the gateway to the Kintamani region. Start here: Read our introduction to Bali for an overview. Most people visit Kintamani for the stunning views of Mount Batur and Lake Batur from the road in Penelokan. Clouds often move in during the afternoons, arriving early in the day provides better photo opportunities. The rim villages of Kintamani, Penulisan, Batur, and Toya Bungkah are easily reached from Penelokan and are enjoyable to explore. Although the villages once sustained themselves primarily with fishing and fruit orchards, tourism has taken over as the lead industry. A large market is held in Kintamani every three days; take advantage of the cheap Indonesian food, fresh-caught fish from the lake, and quality oranges from the region. Perched above the village of Penulisan is Bali's highest temple. Pura Puncak Penulisan was rebuilt in 1926 after the volcano claimed the original Hindu temple. The climb of 333 steps provides excellent views of the coast and surrounding landscape. Statues inside the temple date back to before the 11th century. Proper dress and a donation of at least $1 is expected to enter Pura Puncak Penulisan. Right to the Temple: Read our guide to Bali’s temples for more info on Kintamani's places of worship. Make no mistake, Mount Batur – or Gunung Batur – is still active and new eruptions have even surprised backpackers who were climbing to the summit. The giant caldera is partially filled by Danau Batur, the largest crater lake in Bali, as well as settlements and villages around the rim. A 2300-foot-tall secondary opening juts out of the crater lake and erupts frequently. Tourists wishing to visit the crater rim can grab one of the orange bemos (minivans) from either Penelokan or Kintamani Village. Bemos shuttle people throughout the day for around $1 one-way. Amazing views of Lake Batur can be seen on a clear day, however too much hassle by guides and souvenir hawkers make most people snap a picture and leave quickly. Climbing Batur: Although the multitude of guides in Kintamani will say otherwise, physically fit travelers can summit the volcano independently without a tour group. Reaching a peak of 5,633 feet, climbing Mount Batur can be done in one day with proper shoes, however unexpected rain can make the shale loose and dangerously slippery. Steep, crisscrossing paths to the summit make it difficult to discern the shortest route - around two hours - from the longest route of ten hours! Right to the top: Read more about Mount Batur and climbing volcanoes in Indonesia. The volcanic activity in Kintamani has given way to a number of spas and hot springs that tap into the scorching temperatures below the surface. The Batur Natural Hot Springs can be reached by a steep, downhill road from Penelokan. Located directly on the western edge of Lake Batur, the hot springs has both hot pools and cooler lake-supplied pools. Mats for lounging along the lakeside are the perfect place to get a drink and relax after a long day of exploring. The Kintamani area is located in northeast Bali, along the same north-south road that stretches between Ubud and Penelokan. From Kuta: Transportation to Kintamani can be arranged in travel agencies and guesthouses around Kuta. Minibuses often travel through Denpasar and Ubud on their way to Kintamani; the ride takes just under two hours, depending on stops and traffic. If going straight to Kintamani from the airport, first get a ride to the central Batubulan bemo/minibus terminal. Minibuses leave sporadically when full to Kintamani; the price is around $3. Local bemos make dozens of stops along the way and require a lot of patience! From Ubud: Both tourist and local buses run daily between Kintamani and Ubud in Central Bali; the journey takes just under an hour. Book your ticket from one of the many travel agencies in Ubud the day before. Read our suggested list of budget hotels and homestays in Ubud, Bali. Kintamani accommodations: If you plan to spend a night or two within view of Lake Batur or Gunung Batur, that can be easily arranged. Resorts in the area range from four-star to no stars at all, with most of the beds biased heavily towards backpacker travelers with slim budgets. By Motorbike: Having your own transportation to explore Kintamani is a big advantage. Scooters can be rented in Ubud for around $5 a day. If confident enough on a motorbike, enjoying Bali on the open road is unforgettable. Once past the congestion centered around Ubud, the road north is enjoyably straight and easy to ride. All vehicles are required to pay 60 cents entrance to the region just before entering Penelokan village. An abundance of rain keeps the Kintamani region lush and green throughout the year. The wettest months of January to February sometimes make roads impassable. Kintamani still receives rain during the drier summer months; plan for the worst if riding a motorbike or if attempting to climb Mount Batur. While not nearly as cold as Mount Rinjani in Lombok, evening temperatures in Kintamani are still cooler than expected in Bali. Tsunami Ready Hotels in Bali, Indonesia - How Safe Are They?